Get ready to step into the breakfast cooking race as players hurry to correctly build up their ordered pancake before the opponent does. Too bad he griddle and the customer's table are about 15 feet away. Make sure not to drop your food - no one wants to eat dirty pancakes. Pancake Pile Up is a perfect game for energetic kids and will help teach them out to play games and increase their eye/hand coordination all while creating a fun atmosphere. Different flavor pancakes include blueberry, strawberry, banana, chocolate chip and plain. Play as two people or in a relay team. Give Pancake Pile Up a try today. To win you'll need to be the first to stack the pancakes on your plate in the sequence shown on the order card. 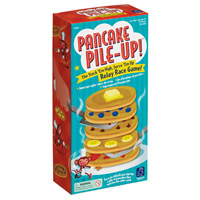 Pancake Pile Up comes with 10 pancakes, 2 pats of butter, 2 plates, 2 spatulas, 10 order cards, griddle game board and the official Pancake Pile Up game rules and instructions. Please keep in mind that the official Pancake Pile Up childrens rules and instructions could be different depending on the game version you have. The rules below are some of the exact directions on how to play Pancake Pile Up. Share with us your comments, funny stories, tips, advice, strategies, creative ways to play, questions about how to play, problems with the rules or anything you want about Pancake Pile Up. All submissions will be reviewed within 24 hours. Click here to add your Pancake Pile Up comments.